This is a collection of various resources I, and hopefully you, will find useful for wargaming and hobby stuff. If you have something you feel would be worth adding to this list then please contact me and let me know. A breakdown of resources by specific game. Age of Sigmar Official Facebook Page – The official page by Games Workshop for Age of Sigmar. Age of Sigmar Resource Guide – A collection of resources from around the web. Lots of great stuff here. Guide to the Grand Alliances – Written by our own Jack, here’s a series of articles covering the Grand Alliances. Blood Bowl Official Site – The official site for Blood Bowl by Games Workshop. Blood Bowl Official Facebook Page – The official page by Games Workshop for Blood Bowl. Blood Bowl Tactics – An amazing website for all things Blood Bowl. Learn About the Blood Bowl – My intro for new players to explain the game. A Guide to Playing 40K Faster – Useful information to help you speed up your games. Command Center – Free online army list building tool. Eldar Dictionary – A collection of known Eldar words and phrases translated to English. How to Play Warhammer 40K – A series to help aspiring and new 40K players learn to play the game. How to Save Money on Warhammer 40K – A resource of ways to save money. Regimental Standard – A fun and humorous blog by Games Workshop featuring “reports” for the Astra Militarum. Warhammer 40K Custom Missions – Thor is creating custom Maelstrom of War missions to add to your collection. Warhammer 40K Official Facebook Page – The official page by Games Workshop for Warhammer 40K. Game Review – My review of the game. Tournament Restricted List – The official list of restricted and banned cards for the game. Warhammer Underworlds Deck Builder – The official deck builder from Games Workshop. Warhammer Underworlds Official Site – GW’s site for the game. Also includes a deck building tool. Underworlds DB – A player created deck builder that lets you save your decks and share them. Official websites and resources of Games Workshop. Forge World Official Facebook Page – The official page for Forge World. Games Workshop – The official site of Games Workshop. Games Workshop FAQs/Erratas – Updates to core rules and codices (English). Warhammer Community – Official blog/news site for Games Workshop’s games. Warhammer TV – Official YouTube site for Games Workshop. Various videos including painting tutorials, new release information, and more. A list of hobby resources like websites, and useful techniques. 3D6 Wargaming – Hand-made custom counters, token, and more for wargaming. Amazon – There’s a good amount of Warhammer 40K, Age of Sigmar, and other miniature games found here. Blick Art Materials – A great online store where you can buy premium brushes like Winsor & Newton and Raphael. eBay – You can find nearly anything you’re after here. Effin Cool Minis – Alternative models, gaming objectives and more. Element Games – Wargaming hobby store with a wide range of products for various wargames. K&J Magnetics – Huge range of magnets. I use them for all my magnet needs. Miniature Storage – This is a site of mine where I cover all the miniature storage solutions out there. Wargame Exclusive – Amazingly sculpted 3rd party models. Wayland Games – Discount online retailer covering a huge range of games. Barbed Wire – Simple method for creating barbed wire with pipe cleaners. Corroded Plate – An awesome walkthrough on creating rusty, weathered, corroded armor. Glossary of Miniature Painting Terms – Explanation of painting terms with examples. How to Improve Your Hobby Building Skills (Book #1) – This is actually a book by Joe from Broken Paintbrush. It’s a great resource for those newer to the hobby. How to Improve Your Hobby Building Skills (Book #2) – The second book in the same series by Joe. How to paint heat stained gun barrels – Simple but effective technique. How to Rebase Miniatures – This will save you a ton of time for your rebasing needs. Painting Glowing Powerfist, Part 1 – Step by step with theory. Photographing Miniatures – A good guide by Games Workshop on photographing your models. Nurgle/Daemonic Skin – Super easy method for making fleshy daemonic skin. Loaded Brush Painting Technique – Website explaining the loaded brush painting technique. Loaded Brush Video – A video showing the loaded brush technique being applied to a miniature. From the Warp – Defunct but still useful hobby resource. Our Tutorials – We have some great tutorials on various things. 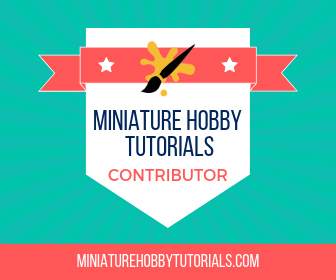 Miniature Hobby Tutorials – A directory of community submitted hobby tutorials. The Golden D6 – A great hobby magazine with a ton of awesome articles. Wargaming Tradecraft – Great resource for painting and hobby stuff.